parigha = an iron bar or beam used for locking or shutting a gate. Also (depending on context): a line of cloud crossing the sun at sunrise or sunset; two birds flying on each side of a traveller (regarded as an omen); a virtuous person. This pose is commonly known as the Gate Bar or Gate Latch Pose. Among the 198 poses in Light on Yoga (see p. 73, plates 37-39), it’s one of the true side bends (or more technically a lateral bend). What does this mean? In Triangle Pose (trikonasana) for example, the torso is extended to the side over the forward leg, but the attempt is made to lengthen both sides of the torso evenly. In Parighasana, the torso is curved to the side over the straight leg, so that the underside of the torso is compressed and the topside is fully stretched. For this pose, you’ll need a thickly folded blanket to serve as a pad for your knee. I also recommend using a wall to support the sole of the side-stretched leg. The pose described immediately below is a simplified variation of the full pose (see plate 38). See the VARIATION section for a description of the full pose (plate 39). 1. Kneel on the floor with your right side to the wall. Stretch your right leg out to the right and press the heel to the floor and the ball of the foot to the wall, toes pointing up (you may also pad the heel if needed). Keep your left knee directly below your left hip (so the thigh is perpendicular to the floor), and align your right heel with the left knee. Turn your pelvis slightly to the right (so the left hip point comes slightly forward of the right), but turn your upper torso back to the left. Turn your right leg laterally to point the knee cap toward the ceiling. 2. Inhale your arms out to your sides, parallel to the floor, palms down. Side-bend to the right over the plane of the right leg and lay your right hand down on the shin, ankle, or on a block outside the right foot. Contract the right side of the torso and stretch the left. With your left hand on the outer left hip, push the pelvis down toward the floor. Then slip the hand up to the lower left ribs and lift them toward the shoulder, opening a wide space in the left waist. 3. With an inhale, sweep the left arm over the back of the left ear. The side bend tends to twist the torso toward the floor. Without pushing the bent-knee hip back (continue to roll it slightly forward), turn the upper torso away from the floor, in this case to the left. 4. Stay in this pose anywhere from 30 seconds to a minute. Come up with an inhale, reaching through the top arm to draw the torso upright. Bring the right knee back beside the left, and repeat with the legs reversed. Contraindications: With any serious knee injury, kneeling might be difficult to impossible. In such a case perform this pose sitting on a chair. Arrange your legs either in front of your torso, knees at right angles; or stretch one leg out to the side, mimicking the full pose. Variation: Full Parighasana is a deep side bend. From the starting position described in step 2 above, lean to the side over the straight leg. Lower the underside of the torso as close as possible to the top of the straight leg. Press the back of the lower hand on the top of the foot, then sweep the top arm over the back of the ear and join the palms. Finish as described in step 4 above. 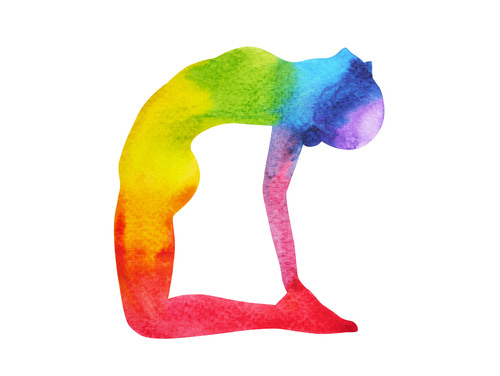 Follow-up Asanas: Parighasana can be used as a preparation for many of the standing poses, like Trikonasana and Parsvakonasana. It’s also a good preparation for Parivrtta Janu Sirsasana. Beginners Tip: If you tend to hyper-extend your knees, brace a block under the calf of the side leg to prevent any compression of the knee.